Indira Gandhi National Open University is the one of the best distance learning education to the students which is situated in New Delhi, India. It is popularly called as IGNOU and it was established in the year 1985. IGNOU is managed by the central government of India. Around 4 million of students are studying under IGNOU in various courses such as Arts, commerce, economics, science, political science, social science and management. IGNOU contains several regional center and study center of all states in all over the country. The aspirants can join any programme IGNOU nearest regional center. 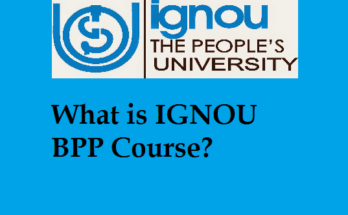 Referring the official portal of IGNOU will help you to know more about IGNOU. Indira Gandhi National Open University (IGNOU) is a learning online national university. IGNOU gives numerous instructional programs at Bachelor, Master, MPhil, and PhD degrees. The applications offered at IGNOU have been in flow such as Humanities & Social Sciences, Science, Teaching & Education, Engineering, Business & Management Studies, Medicine & Health Sciences, IT & Computer Software, Law, Mass Communication & Media, Hospitality & Travel, Arts (Fine/ Visual/Performing). IGNOU takes the admission based on the entrance examination. After the admission, IGNOU will send the acknowledgement to the aspirants. IGNOU will take more than two months to provide IGNOU ID card to the students. Using the ID card, the aspirants can get exam syllabus and study materials from the official website. Regional center of IGNOU will issue the duplicate ID card to the students. Before that, the aspirants have to submit 20 rupees of demand draft in the favor of IGNOU, New Delhi. 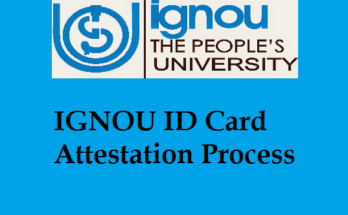 The aspirants can acquire the latest information about IGNOU ID card from the regional study center of IGNOU. Identity card of IGNOU contains name of the aspirant, programme of the aspirant, programme code, duration of the programme, enrollment and address of aspirant. Identify card is the essential things to the students who are studying at IGNOU. The aspirants should wear the IGNOU ID card at the time of campus and the examination. The aspirants must submit their IGNOU ID card after the completion of their preferred course. The applicants can be able to get and access IGNOU ID card online. The aspirants can be able to download the application form to get ID card of IGNOU free of cost from the official portal of IGNOU. The aspirants should fill the application form and attached passport size photo to the regional center of IGNOU. Then, IGNOU will be sent to the regional center of IGNOU. If the applicants who have not received the IGNOU ID card, then they should contact to the regional center of IGNOU. The aspirants can know the ID card status from the official website of IGNOU. If the aspirants who have lost their id card, then they should complaint about the ID card to nearest police station. 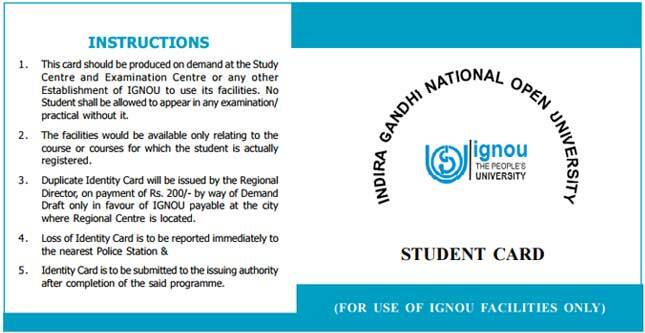 If your IGNOU ID card has stolen, then you have to report to regional study center of IGNOU regional study center. The aspirants need to submit the requisite letter for issuing duplicate ID card in favor of Official coordinator of IGNOU study center. If the students who are not bring IGNOU ID card, then they will not be allowed to appear in the semester examination. Aspirants need to provide written application form from police station, demand draft of 20 Rs in the favor of Coordinator of Study center, IGNOU and then they have to fill the application form. The aspirants should write the required letter for reason of getting duplicate ID card to the regional study center of IGNOU. The aspirants can also download IGNOU duplicate id card application form from the online web portal of IGNOU. The aspirants can easily fill the duplicate ID card application form of IGNOU. Even though, some candidates have the hesitation with the computer, then they should go and pursue the given instructions. Here, we are providing the simple steps to explain about how to get back our lost ID card in IGNOU. Go and visit the official web portal of IGNOU at ignou.ac.in. Select the direct link of “IGNOU duplicate ID card application form”. Now, IGNOU Duplicate ID card application form will be appeared on the screen. Download IGNOU ID card application form into your device. Save and open IGNOU duplicate ID card application form in PDF format. Keep the hard copy of IGNOU duplicate ID card application form, if you required. And then, enter the required details such as enrollment number, programme code, name of the programme and duration of the programme. Make the 20 rupees payment in demand draft. Attach the recent passport size photograph with the application form. Provide the valid signature in the application form. Then, submit the duplicate ID card application form to the regional study center of IGNOU. Submit DD of Rs 200 in the favor of IGNOU payable at regional center concerned. attach the file of the receiving along with the letter. Attach one passport size photograph along with the ID Proof of urs. We are very blissful for you for being here IGNOU News and watching our post. We promise that we will bring up to date our site with further information on the regular basis.